Encoded with lossy compression technology, M4A is a high-quality audio format that widely used by majority of users. Nevertheless, you perhaps have to manage your M4A files with more systematic method. To keep them organized, you are supposed to strip excess sections from the original M4A source. It will be much better if you can get a destination audio with no quality loss. How to make it? Now what you have to do is follow my steps to learn more information about the top-listed 5 best M4A splitting tools. 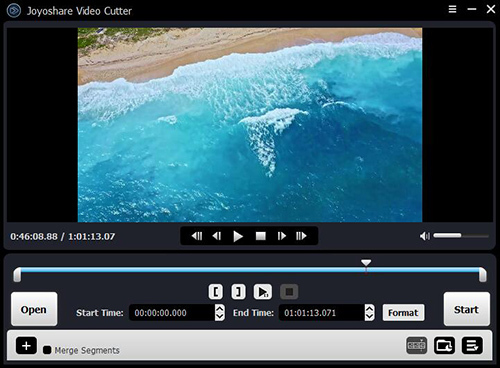 Without re-encoding your M4A files, Joyoshare Media Cutter is fairly a reliable splitting tool that can be used to process any M4A file in high quality. Under the help of it, you can leave out any unwanted sections to make its size smaller. It also allows you to generate your destination files into any format, such as MP3, FLAC, AAC, AC3, AIFF, WMA, AU, M4A, etc. Notably, this competitive tool is able to carry out any cutting assignment in fast speed with max limit up to 60X. That is to say, it is available to accomplish the process instantly. Additionally, you can also empowered to customize your new output audio by setting up the format, quality, bit rate, codec, etc. With the exception of acting as a M4A splitter, Joyoshare Media Cutter can serve as a professional media joiner as well. It is capable of assisting you to merge various audio & video fragments into a new one. 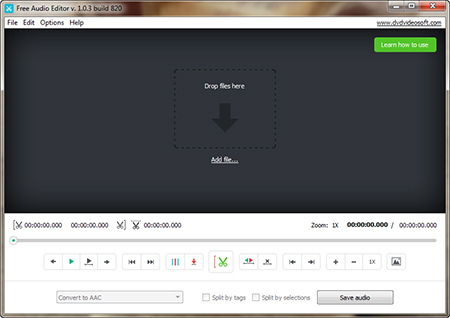 More powerful, if you desire to extract audio from original video, this tool can do it for you. 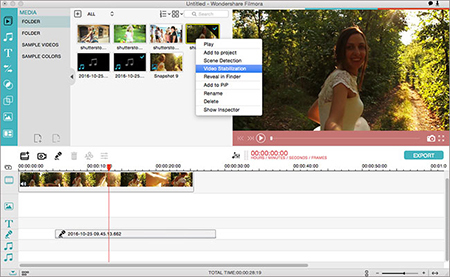 Filmora Audio Editor is one of the most highly functional editing programs. By taking advantage of it, you can get more chance to rework your M4A audio files. It permits you to cut, mix, delete, copy and paste different M4A segments. Furthermore, you can also join them or create DVDs out of the file format. To enrich your audio file, Filmora Audio Editor authorizes you to control the speed, pitch and volume based on your needs. It delivers a wonderful platform for output formats. You can export your M4A audio as MP2, WMA, MAV or the same M4A format. Any audio file can be shared on Internet, like YouTube, Vimeo, Facebook, etc. By providing online solution and advanced features, FileLab Audio Editor can bring you the best service to deal with your M4A files. No any special technology requirement, you can directly split your M4A files in a browser. Amazingly, it facilitates you to create unique ringtones for you mobile phone. This tool also gives you an enjoyable access to add colorful effects to the designated M4A file, for instance, normalize, amplify, auto correction, fade, delay and equalizer. Once you have made a customized setting, you can save your audio file as MP3, WAV, OGG, WMA, MA4, etc. Certainly, according to your own preferences, you can decide to share it to other social platform. 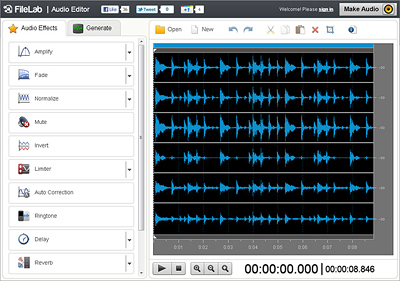 As an easy-to-use audio editor, Free Audio Editor can help you cut off any needless portions in high performance. It includes full support for a large amount of input formats, aside from M4A, you can also import audio in form of MP3, WMA, WAV, AAC, OGG, AC3, FLAC, etc. Having edited your M4A files, you can produce it to any popular format, like MP3, OGG, WAV, WMA, etc. Moreover, it also offers ability to adjust quality in your way. 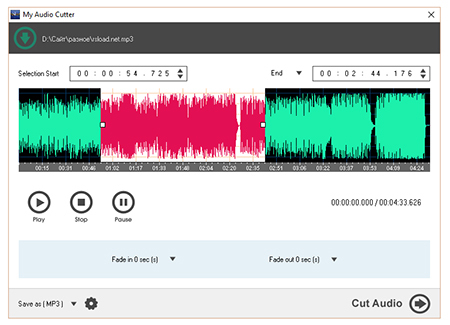 Similar to Joyoshare Media Cutter, it is a handy tool to combine WAV, WMA, MP3 and more files which are in various formats, tracks and frequencies into a new file. If you would like to copy an audio CD to your computer for later playback, you can do it at your own will. With intuitive and user-friendly operating interface, My Audio Cutter is a compact program that is well designed to split M4A audio files into small pieces. To enhance the cutting accuracy, it is feasible to play the selected parts for your previewing. Surely, you can make use of it to define start and end time or length in visual or manual mode. Intending to play destination audio files smoothly, My Audio Cutter is workable to add fade-in or fade-out effects. It is also supportable to store finished audio as MP3, MP2, WMA, WAV, AIFF, OGG, FLAC, AAC, AC, M4A, etc. Alternatively, this smart tool has capability to extract audio from video easily and keep audio tag information completely. All these mentioned M4A audio cutters can come in handy when asked which program has ability to rework your large M4A audio files. Any of them can keep desired sections left by removing unsatisfying parts. However, each one has their own features. If you show interest in a clean interface, My Audio Cutter is a good option for you. On the contrary, Filmora Audio Editor is more complicated for newbies, which is equipped with diverse editing features rather than audio cutting functions only. As a result, to look for a decent M4A splitter that can not only meet your requirement but also operate with ease, you can try Joyoshare Media Cutter.